With an all day rain in the forecast, I was not in too great a hurry to do anything this morning. However, when I checked the radar there was no rain showing up west of us to the west of Michigan and south of Ohio. There was a light drizzle on the way down to the park and on the way back to the station. This stopped around 8 am and the rest of the morning was dry. However a dense fog bank did roll in just before 11 am reducing visiblity to under 100 M.
Bird wise yesterday morning there were very few WTSP calling and we ended up banding a pile of them as well as HETH. This morning there was a real din of WTSP and the banding total was down 60% for WTSP and 75% for HETH compared to Friday!!!!! 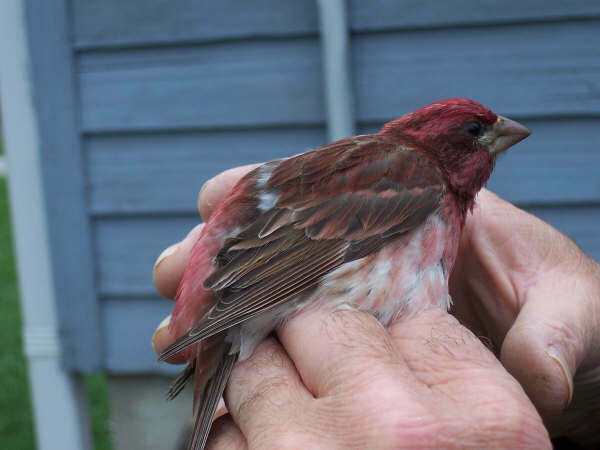 However today was still a good banding day at Selkirk for the 3rd day in a row. Of note, John Dickie had a GREG at the tip Friday afternoon. Lots of people didn’t show thinking that the early morning rain would act to postpone the event but….nope. We carried on. The rain did delay the opening of the nets. When it turned to a light drizzle, around 7:00, we opened most of the nets. During the night there was an influx of Chipping Sparrows – we banded 14, retrapped 2 (birds banded last Spring) and estimated there were at least 40 around the site. 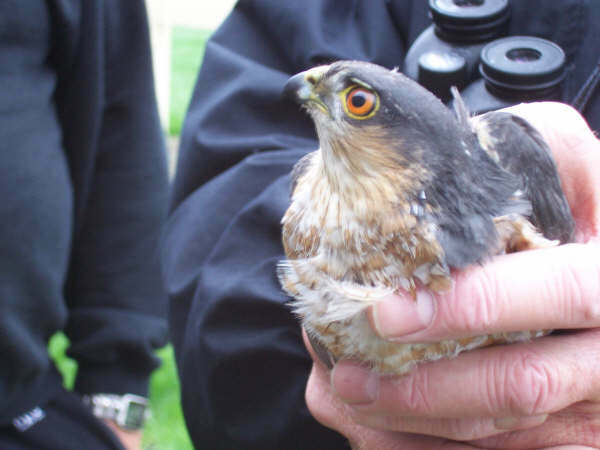 Jim (Biggar) caught a Sharp-shinned Hawk – it flew into the net beside his head as he was extracting a SCJU. The Junco escaped; the hawk didn’t. (See photos below). Brian had our first Western Palm Warbler of the season on census. As well as cleanup, there was an art display/sale in the Coach House – so there were lots of people around. This activity probably interrupted the catching, especially in the nets close to the parking area. The bag piper certainly wan’t attracting any birds. 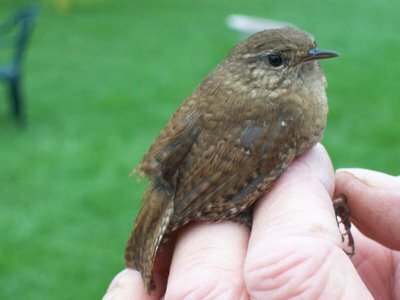 Still, we banded 31 and retrapped 15. Banded: 1 SSHA, 1 EAPH, 2 WIWR, 1 GCKI, 1 RCKI, 2 HETH, 1 AMRO, 14 CHSP, 1 SWSP, 2 WTSP, 1 RWBL, 1 PUFI, 3 AMGO. Retrapped: 1 HAWO, 4 DOWO, 2 BCCH, 2 CHSP, 1 SOSP, 1 SCJU, 1 PUFI, 3 AMGO. 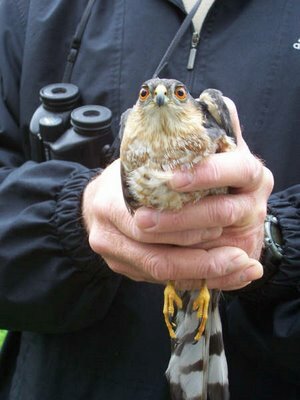 A Male Sharp-shinned Hawk – commonly seen at Ruthven but rarely banded. 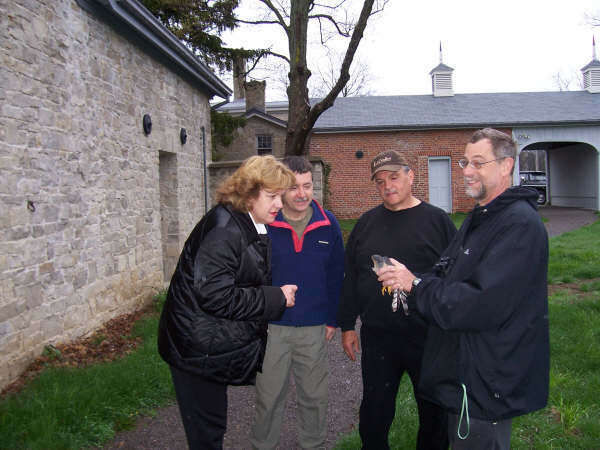 Jim Biggar showing the Sharp-shinned Hawk to Ruthven CAO Marilyn Havelka and board members Lee Merritt and Jim Smith. Hey, Great write up, I love the pictures. I have banded hundreds of days at Ruthven (I think this is my 10th year) and have yet to be there when a hawk is captured/banded! Nice catch!